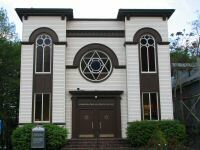 Click here to view the inside of our synagogue. The building was dedicated in July 1913. And, yes, the balcony was originally where women sat. Now it holds the overflow from the main floor during High Holy Day services. We also have our children / students in the balcony while Cantor Burton conducts them as a shofar choir for the end of Yom Kippur.